Well, I could tell you that I was born and raised in Miami Fla. ,was in the U.S. Army for 21 years , a Paratrooper and Jungle Expert , developed and taught the first Emergency Medical Services program for the 82nd Division and Fayetteville Technical Institute , was a hemodialysis practitioner developing hospital units in the army and civilian community , and finished my military career as supervisor for Maternal Child Health….. But, I’m sure that would not interest you. So, I’ll tell you the following. I’ve always had a great love and respect for animals and in particular dogs. I did not come from a family of dog fanciers and I enjoy a good mix breed dog as well as pure bred. What I really like to do is work with dogs. 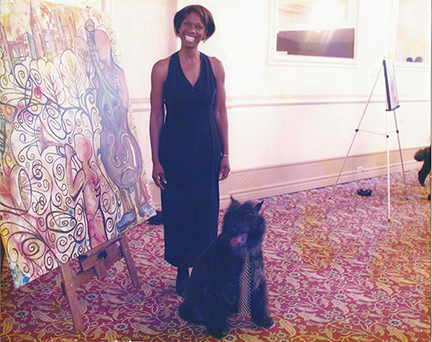 I began my formal tutelage in 1970 with a Ms. Jaima Youngblood, who taught me basic behavior, training and handling of Doberman Pinchers (I did my first Novice A, dog that year. Since then I’ve trained with Walter Hoffman of Germany (Schutzhund) Henk Harmers and Mrs. Cor Valentijn of the Netherlands (learning the Bouvier), Poco Rivera (Dept . of Defense – Bomb detection for the Olympic Korea 1986) just to name a few. I even got off a bus once to watch a man train his dog in a park, and I still use some of his techniques. I strongly believe in obedience training for dogs whether he is titled or not. We have duel titled many dog and have accomplished this while showing in the conformation. During the months of Jan . 1997 and July 1997. I have duel titled five Bouviers conformation and obedience, one Wolf Hound and a Rottweiler. 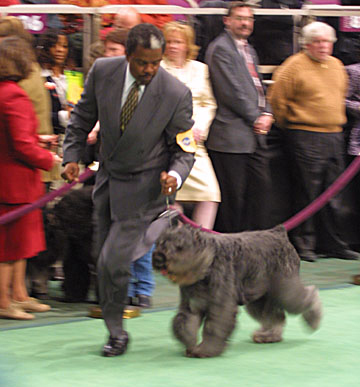 I also had the first Bouvier Best in Show High in Trial (same show) and High Aggregate score in Canada. It should be clear that I feel that a dog should be a useful member of the family. Many of my personal and clients show dogs are personal protection trained by me. My definition of a true show dog is one that has the conformation, temperament and has the ability to do the work it was bred for. Of all the experiences in my life time I find showing a dog the most gratifying, challenging and the most intense. Since 1984, I’ve traveled to Europe yearly searching for quality Bouviers and sometimes Rottweiler, German Shepherds and Malonois. I’ve developed strong ties with many of the breeders who in turn have visited my family. We have maintained quality Bouviers that also function as a true family , dog companion and protector. Our dogs are medium sized, short backed, coby , correct coat, solid in conformation and working ability. I’m proud that we have been able to furnish quality dogs that do more than just “left hand circles” (conformation). 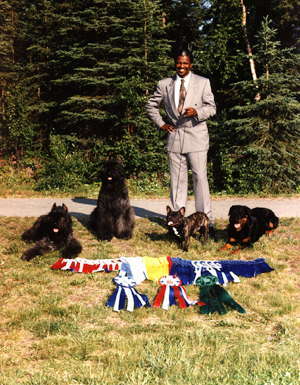 I have also developed excellent rapport with breeders in the United Stated and can obtain that hard to get show dog. The one that is not seen by the general show person. So if you are in the market for a great puppy or a champion special, whether it’s a Bouvier, Boxer, Rottweiler, Doberman Pincher, Great Dane, German Shepherd (American or German standards), Bullmastiff, Akita, Saint Bernard, Miniature Schnauzer, Welsh Terrier, Smooth Fox Terrier, English Setter or Irish Wolfhound. I can probably obtain it for you. These are the breeds that I’ve shown, and or titled. Let Reid tell it, he would say that he saved me from the life of corporate burnout and introduced me to a heart fulfilling life of the dog world. I suppose some of it is true. Before I met Reid, I had graduated from Howard University with a degree in Mathematics and was working in marketing management with what was then called “ Mama Bell”. Finding it hard to resist Reid’s come-on line of “Would you like to come home and meet my dog” I met his Doberman, Jaghellon, who marked my shoe. I guess to let Reid know that he should keep me around. That was 25 years ago and my business suit is a comfortable paid of jeans. I manage the family business, boarding the Kennel, obedience school, and the pecan grove. Those of you in the dog world know that part of having a dog is bragging rights, so, I’ve had some awesome experiences with dogs. I’ve trained a national high scoring Bouvier in obedience (most of our dogs are dual titled). I’m a certified evaluator for therapy dogs through the Delta Society and we work closely with several rescue organizations. I’ve trained dogs for many national TV commercials, written numerous articles and trained a service seizure dog and owner. At days end, the smile of proud owners is just unforgettable.